These Easy Mashed Potatoes with Sour Cream are the most delicious mashed potatoes you will ever have. They’re light, creamy, buttery & easy to make with the help of your stand mixer – No hand mashing required! May I present you with the most perfect of mashed potatoes? 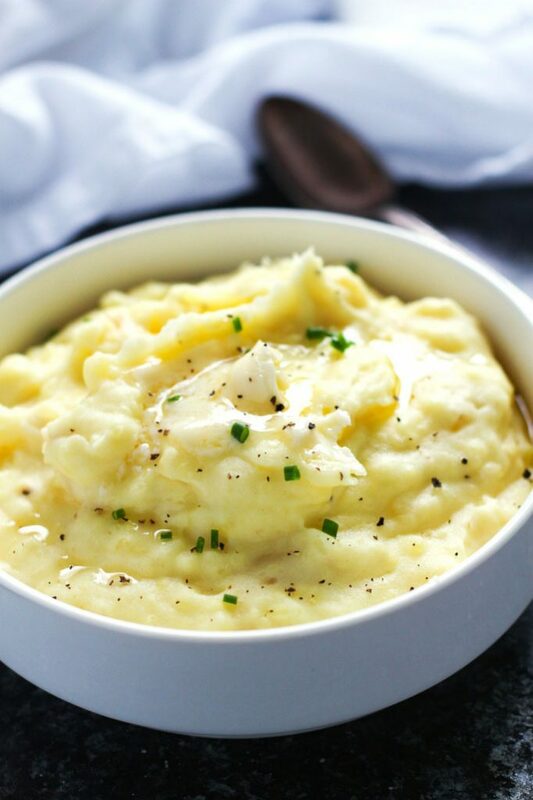 Light, creamy, buttery and tangy – All the great things you want in a bowl of mashed potatoes. But another bonus? There’s no hand mashing required. The key here begins with boiling your potatoes in salted chicken broth. You know how you salt your pasta water? This is kind of the same idea. The broth will impart a flavor to the potatoes from the outset and give you that extra flavor that mashed potatoes can sometimes lack. After the potatoes are cooked, I like to use my stand mixer to get them really smooth. Starting first with the paddle mixer attachment and then moving to the whip. You can also use a handheld mixer. Or, you can go old fashioned, and use a good old potato masher if you don’t have an electronic one. I always forget how simple it is to actually make these potatoes. You can peel the potatoes if you like them really smooth. But, if you’re short on time, just go ahead and leave the skins on. Then, just let them cook away while you work on your main dish – They’re perfect served alongside this Easy Roasted Chicken or Slow Cooker Osso Buco. These Easy Mashed Potatoes with Sour Cream are the most delicious mashed potatoes you will ever have. They're light, creamy, buttery and tangy and easy to make with the help of your stand mixer - No hand mashing required! Cut the potatoes into 1-inch cubes and place them in a large pot with the chicken broth. Add enough water to cover the potatoes and add about 2 tablespoons of salt. Bring to a boil, then lower the heat and simmer, uncovered, for about 10 to 12 minutes, until the potatoes fall apart easily when pierced with a fork. Meanwhile, heat the milk and butter in a small saucepan, until the butter is melted. Keep warm. Place hot potatoes in mixing bowl and mix until smooth, about 1 minute. Slowly add in milk/butter mixture and sour cream. Turn up speed and beat for about 30 seconds, or until milk is absorbed. Gradually turn up speed and mix for 1 minute longer. Switch to whipping attachment and beat for about 1 minute, or until fluffy. Serve warm topped with extra butter (if desired) and chopped chives. This post was originally published in November, 2014. It was updated in November, 2016 with some new pictures. The recipe remains the same – It’s definitely a keeper! I regularly make mashed potato to accompany dinner but never have added sour cream before. Definitely will be doing so next time I make some! It really does add extra creaminess and great flavor! These look delicious! I am in charge of the mashed potatoes for Thanksgiving dinner this year. I may just have to try out this recipe! Erin, such a simple dish, yet so perfect. I think you nailed the proportions in this perfectly! My mom makes a mean potato casserole with sour cream. 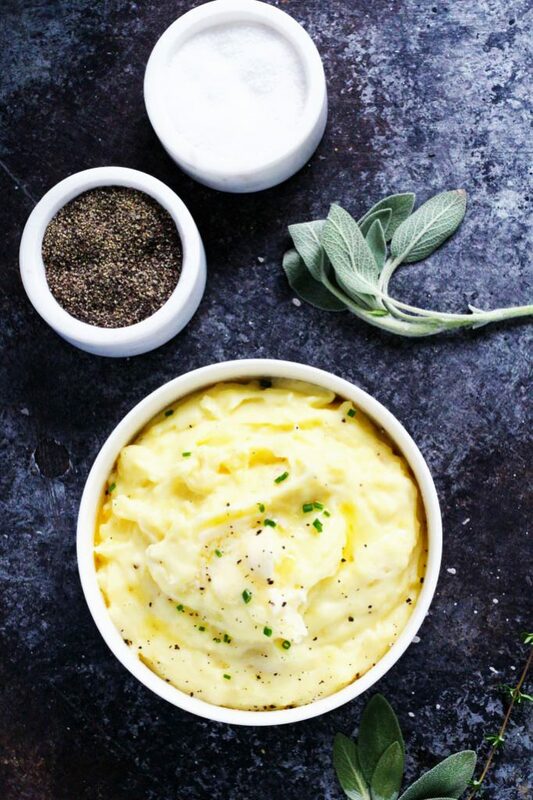 I can’t eat my mashed potatoes any other way now – your version looks so velvety and luxurious!!! Oooohhhh – That casserole sounds amazing too Taylor! Yum! Erin, you make mashed potatoes look so elegant! Gorgeous photos! And I love mashed potatoes with sour cream (well, dairy-free sour cream for me). YUM. Thanks Marlynn! That means a lot coming from you! I love the idea of boiling potatoes in salted chicken broth. Why didn’t I think of that? 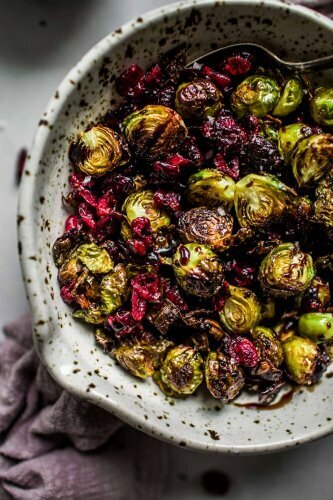 These look like the perfect Thanksgiving side or a special treat for a Tuesday! Thanks Karen – These are definitely easy enough to make on a Tuesday! 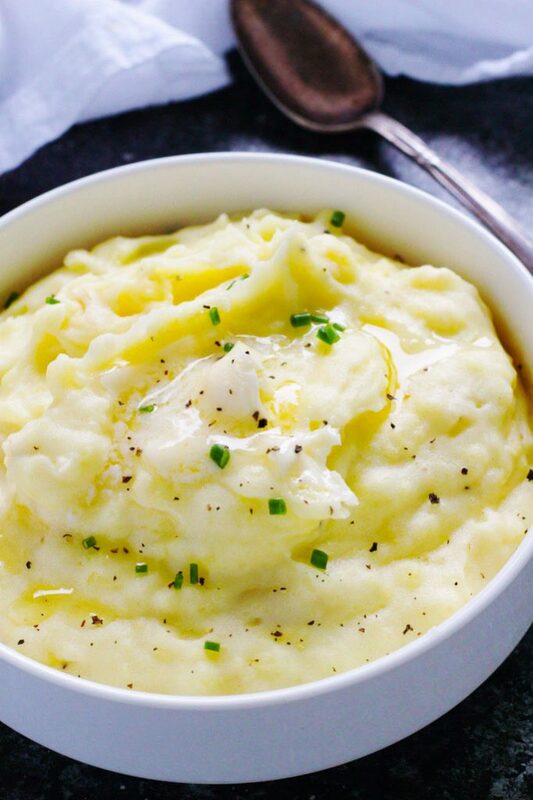 I always think of mashed potatoes as a “feat”, but really, these are simple! I love the creaminess of mashed potatoes with some alternative dairy instead of milk. I use yogurt in mine. It makes them a little tangy and extra creamy – but without as much fat as sour cream. Plus, we always have yogurt in the house, so I don’t end up with a half-used container of sour cream that I won’t use up later. Great suggestion Catherine – I swap yogurt for sour cream quite often too. It’s hard to tell the difference sometimes! I wonder why I’ve never heard of boiling potatoes in chicken broth. That sounds genius! 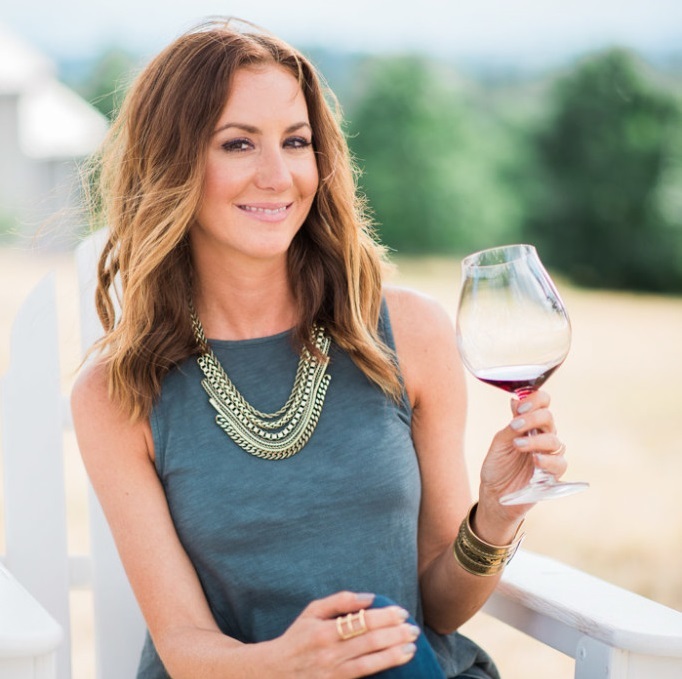 It gives them such great flavor right from the start Carissa – I don’t make them any other way now! Yum!! 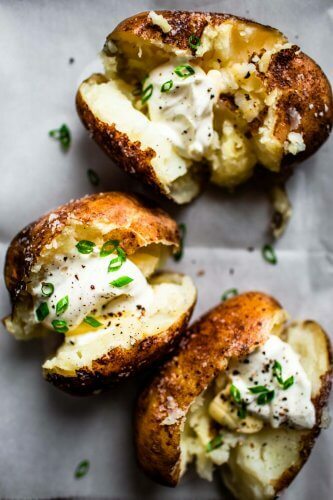 Love mashed potatoes and I think that the sour cream would make me fall in love with them all the more. Thank you for the inspiration! Using chicken broth makes a difference. The flavor is better, but no one can identify what the “secret ingredient” is.! I totally agree Amanda – It’s kind of like flavoring the potatoes from the inside out! Oops. Potatoes. * Also, one more question. 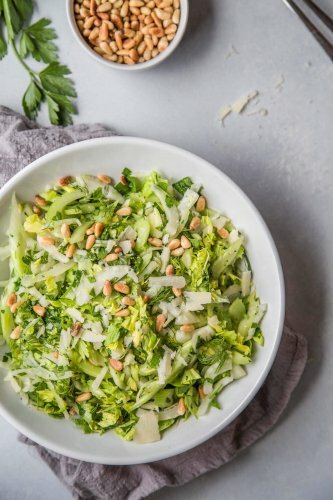 If I wanted to make this for someone who prefers nut milk in their recipes, what would you recommend? As far as nut milk Crystalini, I would maybe try substituting in some cashew milk for that creamy flavor. Enjoy! 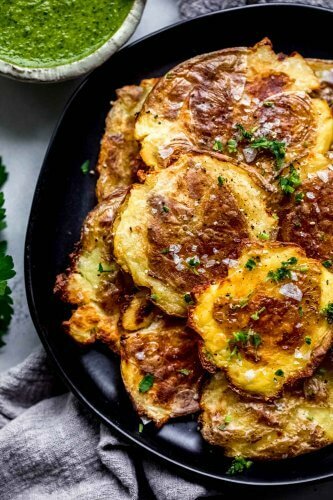 Can these potatos be made the day before? Hi – You can definitely make the day before! I would reheat them in the oven or microwave. I am in charge of the mashed potatoes this year for our Thanksgiving Feast. What are your thoughts on keeping them warm in the crock pot as I transport them over to my brother’s house and then attempt to keep them warm for our dinner?